Celebrations for me are small treats not grand events. However, this June for my 80th birthday I had a GRAND Event. All four of my children made the trip for their first time to Nicaragua. Rivka and Aaron, my youngest two had planned their one-week trip to be here for my birthdate. The night before they were leaving CA, my oldest son, Greg, got a ticket and met the younger two in Houston. Three out of four on my birthday was pretty exciting, knowing that my oldest daughter and her family were arriving two weeks later. Greg, Aaron, Rivka and I stayed at my condo and had a great time mostly tranquillo. I was able to tour them around our area and introduced them to many of my friends and of course my two Nicaragua families—Guzmán, and Urroz Zavala. We had two dinner parties with friends at the condo and had a blast with both groups. The last two days of their stay the four of us traveled to Granada for one day and night and then to Managua for a day and night. I saw things in Granada and Managua for the first time as a tourist—the inside of the cathedrals in Granada, and Salvadore Allende Park and the museums there in Managua. The Ruben Darío museum was particularly interesting since the speaker at the El Limón Salon two days earlier featured Ruben Darío, his life’s work and influence on the people of Nicaragua. Aaron, who came to the Salon with me, and I were quite impressed with the museum and the knowledge that we had received from the Salon. After the Wilkers left, three of my expat friend groups arrived for short visits to Rancho Santana. This gave me more chances to show them progress at my Guasacate house and check out for myself the daily changes. Enjoyed the opportunity to catch up on the lives of my coming and going friends. On June 27th Leah, Tim, and Isaiah Smith, Isaiah’s friend Ricky Guzmán, and my cousin Suzi Taylor came for one week. Since I couldn’t fit all of us in my car at one time, we rented a van and driver to be with us for the 7 days they were here. My friends Dolores and Bill Watson gifted me use of their beautiful big house in Los Perros as a birthday present. This family was a lot more active and wanted to “do stuff”. 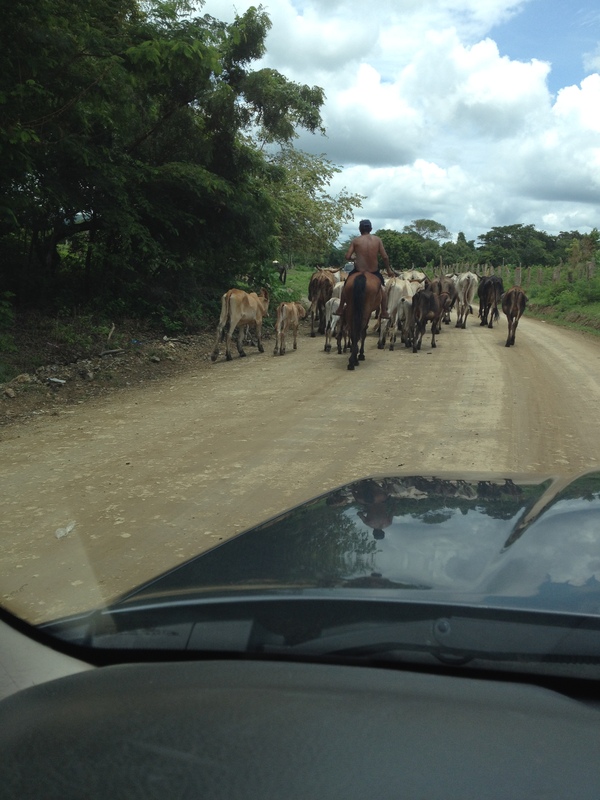 I sent the group with the driver to go “quading” in San Juan del Sur. Maurice, my friend the driver, took them to a high point nature reserve on the ATVs. Spots that I didn’t know existed. We had several awesome meals at the Watson’s house but no outsiders for dinners there. We were a tribe unto ourselves for three days. The last two days we went to Selva Negra in Matagalpa which is a lot cooler. There we toured the coffee farm and finca areas. It rained the whole time we were there, although this didn’t stop Tim, Isaiah and Rickey from a very long hike in the foothills. We decided to leave Selva Negra early and go to Chichigalpa to tour the Flor de Caña plant. That was a spectacular tour, although I am not so sure I would recommend rum for breakfast at 9:00 am. The rum was excellent quality though and not such a bad breakfast after all. From Chichigalpa we went down to Leon, had lunch and a quick tour through town. Maurice knows where everything is and an efficient and fun guide. We checked into my favorite hotel in Managua the Camino Real near the airport for two nights. Again Maurice toured us through Managua, shopped at Wimbus Market, and then kept the van at his house for the following day’s adventure. Maurice took the group to the Volcan Masaya for a zipline that Tim proclaimed to be the best he had done including HI. I stayed at the hotel enjoyed learning about and reading on my new Kindle while sitting around the pool with occasional dips in the water–not rum. We had dinner at the hotel that last night with Ron Urroz and Ana Zavala. Leah and family got to meet almost all my friends and Nica families too. It was sad to have them all leave and I have tears in my eyes again at the thought of how blessed I was to have all my children here to see my Nica world. Each of my children told me before they left that they now understand my life here a lot better and know that I am safe and loved here. Leah’s family left on the early UA flight on July 4th. My friend Barbara Tenbusch Wisley, owner of the house where I live, came in from FL at 7:00 pm so I waited for her to travel back to Rancho Santana with me. Byron Vasquez, my usual driver/friend, brought my car earlier in the afternoon from RS so that we could do the shopping before Barb arrived. Long and enjoyable day spent reading and planning at the hotel. Barbara was here for almost two weeks and outdid herself getting more cleaning and sorting for the sale of the house. Efforts paid off, she received a deposit for the house the day before she left. I had shown the buyers the house almost two years ago and kept bringing them back up for dinners to see what a fantastic place this is. Now I will have to find another place to live probably sometime around October. I have several options outside of the condo. Since the condo is my main source of income outside of Social Security, I want to keep that rented. Little by little I am evaluating possibilities. The weather has been absolutely spectacular here the past month. Rain a little now and then, nice cool breezes mixed with hotter than hell before it rains. Everything is so beautiful and green. I have watermelon (sandia), cantaloupe, and squash growing out of my compost pile at the house. The trees that I thought were absolutely dead six months ago have green leaves slowly coming out. That is tenacity for sure. To keep me “off the streets” I have embarked on a couple of projects this past week. I will start teaching the Cuidadora de Personas classes again. I keep getting requests for caregivers and then can’t find one. (Same problem as the US.) Instead of having a four-hour class five days a week, I will hold a Saturday 6 hour class for three weeks. I believe that I can impart all the info needed for a caregiver in this timeframe. I spoke to Carmen Guzmán about using a massage room at her spa in Limón #2 for the bed portion of the classes. I will redo some of my info for the longer sessions and hold the first class in the beginning of September. The condo is pretty consistently rented until the end of the year. Not rented everyday but enough to break even monthly. Now I am concentrating on plans for the commercial property and whether or not to build the apartment on the bottom terrace level at Guasacate before completing the upper house where I ultimately plan to live, be cared for, and die. If the apartment could be finished when I need to move from the Wisley House, that would be my first choice of new quarters. It seems like I am always juggling multiple small projects that keep me occupied—wound care patient consulting, legal research, writing or consulting for business plans for friends both Nica and expat. My life here is fulfilling and I love it. Remember there is always room for guests where I live. The invitation is open. What else can I do when I am so grateful to have this blissful rainy day and the ability to sit here on the Wisley House terrace and listen to classical music from my Sacramento station streaming from capradio.org! Yes, I could succumb to my addiction of playing Candy Crush Soda Saga but alas, I’ve decided to share the latest and greatest news. The hills are now very green and the flowers are blooming profusely around the house. The terrace where I am sitting smells of the multiple gardenia blossoms on the bushes surrounding one part of the terrace. I planted a gardenia bush under the office window in my CA house because I love the smell and I am once again blessed with this aroma. This is also bird nesting season and I have been battling two pair of jarracas who want to build a nest in a funny lamp on the terrace next to where I sit. They have tried to start a nest in the back of the sofa where I sit. I talk to these birds and again they don’t listen with their “bird brains”. On the other hand I do listen to their beautiful voices and generally that is how I know that they are on the terrace when I am not sitting here myself. The past week we have had rain almost every day during the day and night with and without thunder and lightening storms. It reminds me of my first year in Nicaragua, 2004, when we had LOTS of rain with rivers overflowing the roads and lakes across the road that were too deep to pass. We didn’t have “chicken buses” then that go through almost unbelievable depths of rushing waters. (I think either the drivers are nuts or they have such a heavy load, 4WD and tough engines.) This past week I was in a line waiting to cross a very fast running deep river and watched as the bus drove through with water up to a little above the back door. Needless to say, I along with several others in the line decided to turn around and go back to whence we came. I know the water stops rushing if it stops raining in a few hours. You still have to drive through the river but you won’t be flipped sideways or hit by a tree or animal as the river races on course. I made my same attempt about two hours later successfully, slowly in 4WD. It is a riot because the village kids think this rushing water is a fun place to jump in and play. I think it is their form of “chicken dare”. Scary since few of these kids know how to swim and in 2004 and 2005 we had three deaths at the very river I am talking about, one was someone who was in an SUV and flipped sideways down the rushing water and the other two were trying to cross on horseback. Things that NGO volunteers are teaching kids are swimming in the ocean as well as surfing. Dr. Basha Healthcare Clinic’s May trip was much more organized and successful. No use of my condo as the treatment space so he had privacy in his living space. Carmen Spa was perfect and he successfully treated 6 to 8 patients at a time on several days. Of course, the local Nica people were given free treatments. What a blessing for all of us. He worked at Carmen Spa in the morning and Rancho Santana Spa in the afternoon. Basha will be coming back again at the end of August and I’m looking at a new Spa in Laguna Apoyo–Hotel Placaya–to service more of the Managua and Granada folk. I need to start working on the logistics before the family comes–Aaron and Rivka this coming Wednesday for a week. Leah and family and my cousin two weeks later for a week. I am so excited to have them see this Nica Life. I have been busy for the past two weeks listening to webinars on investing and health. Actually I’m collecting CEUs to renew my CA nursing license and Gerontology Clinical Nurse Specialist certificate. I’ve had several health issue consultation projects as well this past month. I love these opportunities. It keeps me on my toes and off the streets. My house in Guasacate is now visible to all from the road since the roof is on. I’ll try to attach photos that I took looking from my terrace through Ron and Ana’s house where I could see Costa Rica from my terrace. The electrical wires and tubes are being chopped into the concrete walls at my house and Ron and Ana’s place now has tile floors and lighting. It looks like I’ll have room on the lower level for a small apartment. Ron wants me to design it soon so he can put in the utility infrastructure while he is doing the main house. Progress is being made even with the rain. I’m glad that the roof job is over. I hate to see the workers up on the sloping roof beams when they are slippery. One of the workers fell a couple of weeks ago and broke his collar bone. 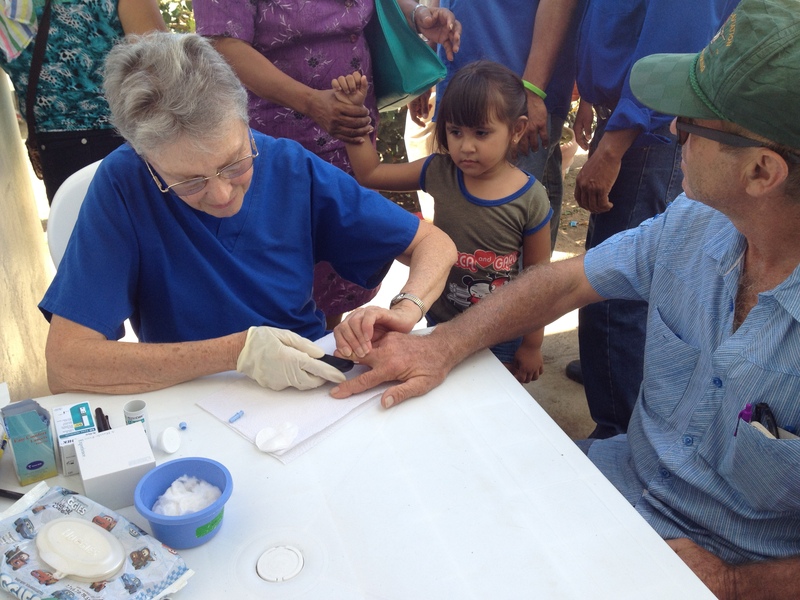 Ron and Ana took him to the hospital in Rivas and the next day to his home in Managua. Construction accidents are very common. I have seen many patients since 2004 who had serious accidents that we treated at the Roberto Clemente Clinic. Enough writing for one month. Next blog will have adventures of Margie’s family in a third world country for the first time. Pretty exciting. Sorry about the photos at the top. I am still trying to figure out how to attach photos in WordPress. I have now exhausted all excuses for not writing this blog sooner. My warm blood froze in both No. and So. CA so I was very happy to return to 80 degrees and finally get thawed out. Although I arrived back in Managua, NI on January 4th, I have been to Managua three more times in two weeks. All were working trips with positive results. The gentleman sitting next to me on the plane from Houston to Managua is the president of one of the largest distributors of medications and related consumable products in NI. As he found out about my work with Aproquen, he offered to help me and the Roberto Clemente Clinic here is Limón #2 by donating medications from his company’s César Guerrero Foundation—the name of the company started by his father. Paul Guerrero is the president of Dicegsa one of the Guerrero Group companies. I do believe that angels look out for me. If I stick to my motto, “Listen and show up”, good things seem to happen. I am grateful that I sometimes have sense enough to listen and that Paul changed seats to sit next to me. Yes, Paul switched seats so that a couple could sit together which landed him next to me. In between trips to Managua there were many friends to see before they headed back to their US homes after holiday visits to their RS homes. I was told by several friends that this was the most crowded they have ever seen it here at Rancho Santana during the winter holidays. Now that the road from Tola is getting better everyday as the cement blocks are being laid, more Managua folks are coming to spend time at our beaches along with the gringo owners. RS has received some impressive PR in the NY Times, Forbes, and several travel magazines. There was even a photo of a gal on the RS beach in the United Airlines Hemisphere magazine that I read on the plane. My condo was rented through the holidays from mid December. Although my friend Nan took great care of the day to day staff details, I needed to handle some repair issues at both the condo and where I live here at the Wisley house. By next week, I think life may get back to normal again—whatever that is for me. This past Saturday the Roberto Clemente Clinic had its annual Health Fair. Of course, I participated again this year by doing blood glucose checks with a glucometer. 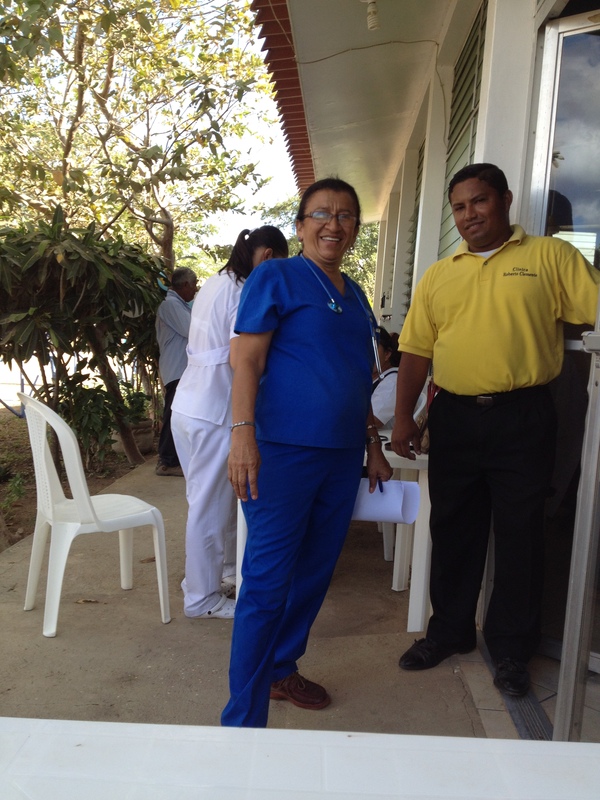 The César Guerrero Foundation donated money to purchase 20 glucometers and strips for the Clinic Fair. This year the weather was perfect and the wind didn’t carry off the cabanas set up for the variety of health triage stations. We had six specialty doctors and four internal med docs seeing patients for six hours. Another successful health fair for sure. My connection for the Clinic with the Guerrero Foundation will continue into the future. The sale of my West Sacramento house was finalized while I was in the US. For this I am grateful. Now my only property is in Nicaragua. The El Limón Salon is active again after the Holiday break. We had a small group on Jan. 17th. Half of the attendees were Nicaraguan. The topic fit perfectly for all of us. How the ego runs our lives and creates separation. Ego defined as Edging God Out. It was very interesting to have dual participation in the discussion especially since the previous two Salons were on cultural diversity and assimilation of cultures. Those of us gringos probably learned more from this Salon than we could have gained in a semester in school. I am slowly able to understand a lot more spoken Spanish and surprisingly think in Spanish as I listen to conversations such as at the Salon. There is hope for me, although my daughter, Rivka, wouldn’t quite agree yet. Planes, Sansa and La Costeña Airlines, are now regularly flying from our new local international airport—Costa Esmeralda Intl.—to Managua and Liberia, Costa Rica. This airport is 15 minutes from Rancho Santana. As a result of the airport closeby many more people are coming to our little remote area looking for property particularly beach front and view property. I am grateful to have been here early or I wouldn’t be able to afford my property soon. Beach property is still 50% less than anything similar in the US, however. The NI government is now putting emphasis on tourism to offset the previous reputation of NI as an unstable and warring country. Although everything in life is subject to change, I trust the stability here. The January “diablo” winds have begun which is drying everything out rapidly. The polvo “dirt” looks like devil dusts in the desert. The wind is keeping the temperature rather cool for us. My maid told me today that it is cold. I smiled, 75 degrees isn’t cold in my mind. Nurse at work, yes, it is me. It became clearduring my holiday trip that I am needed here in NI more than in the US. My family in CA is functioning very well at present and my friends here–my gringo friends–need both physical and mentoring help. This help I can provide lovingly. Each day is a new adventure in my life. Thank Isis–the goddess–I am healthy and have lots of energy. My Guasacate house is going up by leaps and bounds now and is very close to having a roof put on. I will keep everyone posted and remember to take some new photos. I will try to be a better blogger in the future–my New Year’s resolution. No more excuses.